Manchester City‘s record goalscorer Sergio Aguero has scored a joint-record 11 hat-tricks in the Premier League – and they haven’t been short of quality. 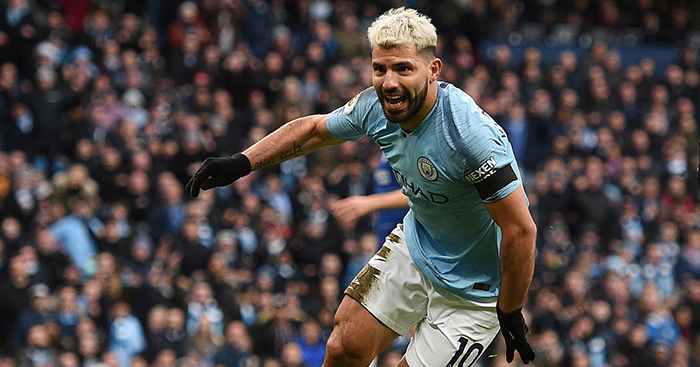 Incredibly, Aguero has hit at least two hat-tricks in every season since 2014-15, keeping up his record with two in the space of three games – against Arsenal and Chelsea no less – in February 2019. That moved him level with Alan Shearer on 11 Premier League hat-tricks – and we’ve ranked them from worst to best, based on difficulty, skill, power, precision and, ultimately, how much we liked watching him score golazos. Aguero scored half of City’s six goals in an end-of-season drubbing of QPR as they secured a second-place finish, but it was not the most difficult of hat-tricks. Not by Aguero’s standards anyway. His first came somewhat fortuitously when a good solo run ended with a ricochet which fell the Argentine’s way, but he still produced a smart finish to clip the ball over Rob Green to give City an early lead. Aguero grabbed his second after the break when he beat Green one-on-one following a defensive error, while a penalty sealed the treble. They all need finishing, but Ben Hamer didn’t cover himself glory in Huddersfield’s 6-1 thrashing by City. First off, he was completely stranded with Aguero and the ball way out of his box, allowing the striker to smartly clip the ball over the stopper from 20 yards. Then Hamer dropped a Benjamin Mendy cross at Aguero’s feet, gifting him an easy second. He couldn’t do anything about the striker’s third at least, as he flicked another Mendy cross into the bottom corner with a deft touch. Aguero’s first on this occasion was the pick of the bunch: a diving header to send Aymeric Laporte’s cross back where it came from and past Bernd Leno, who was heading in the opposite direction. His second and third were both tap-ins from low Raheem Sterling crosses, with the latter actually going in off his arm. Not that he cared. A crazy game saw referee Jon Moss award four penalties, although only two were converted. Aguero cut inside and finished well with his right foot for his first and then scored two penalties to complete his hat-trick before missing a third penalty, half-volleying the rebound over the bar. But after Federico Fazio had been sent off for his foul for the third penalty, Aguero did score a fourth with a tidy left-footed finish to round off a 4-1 win. A perfect hat-trick is always a thing of beauty, and while Aguero’s looked pretty simple, as the old adage goes, they all count. It also adds weight to this ranking, which we’re sure he was thinking of at the time. His first saw him glance home Kevin De Bruyne’s cross, and he converted from the spot for his second before securing the match ball with a low strike following a brilliant run from Leroy Sane. Aguero’s first hat-trick for City came in just his third start for the club, three right-footed efforts which finished up in the bottom corner. His first two were more precise before he ran through and slotted past a stranded Ali Al-Habsi for a third. Aguero’s first hat-trick of the 2017-18 campaign came in a 6-0 crushing win at Vicarage Road. His first was a well-taken header from a Kevin De Bruyne free-kick before Gabriel Jesus squared for a simple tap-in for his and City’s second goal of the game. The Argentine’s third was the icing on the cake, a stunning solo effort as he dribbled through the Watford defence to prod the ball past Heurelho Gomes. Aguero’s first hat-trick away from home saw him single-handedly down Chelsea in a 3-0 victory. His first was probably the pick of the bunch, a clinical finish into the bottom corner, while he never looked like missing when Kevin De Bruyne put him one on one with Thibaut Courtois for his second. He rounded his day off from the spot. Having scored a treble against Arsenal the previous week, Aguero incredibly added another against Chelsea in a thumping 6-0 win. His first was undoubtedly the pick of the bunch. Picking up the ball in a tight area 30 yards from goal, he quickly moved it out of his feet and away from the attention of four defenders before smashing an unstoppable effort into the top corner. He was helped by Ross Barkley’s poor attempt at a header back to Kepa, but Aguero still had to watch the ball over his shoulder and then fire a half-volley into the corner on the turn. His third was a penalty in which he calmly sent Kepa the wrong way after a stuttered run-up. Aguero grabbed his third treble of the 2017-18 season against Leicester, while also becoming the only player to score four goals in a single match that season. His first two were pretty mundane goals, tapping in after good work from Kevin De Bruyne before beating Kasper Schmeichel at his near post. The next two were much more like it, as he cut out a poor Schmeichel pass before neatly dinking the ball over the big stopper, and then wowing fans with a thumping finish from 20 yards via the underside of the crossbar. Aguero became the fifth player in Premier League history to score five goals in a single game in 2015-16, bagging a remarkable personal haul within the space of 20 minutes. His first three – rounding off a perfect hat-trick in the process – took just eight minutes, City’s fastest ever Premier League treble. His pick of the goals were a dink from the edge of the box to complete the hat-trick, and a 20-yard curling strike which found the bottom left-hand corner.